Attention Sophomores: Is college part of your four year plan? If so, on Tuesday, October 9, 2018 we will offer the PreACT to all interested 10th graders. The test is FREE to any 10th grader who signs up before Monday, September 24th. Attention Sophomores: Is college part of your four year plan? If so, on Tuesday, October 9, 2018 we will offer the PreACT to all interested 10th graders. The test is FREE to any 10th grader who signs up before Monday, September 24th. The PreACT is one more tool to check your progress. 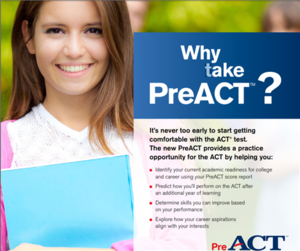 It offers you an early experience with ACT test items, provides a predicted ACT test score, and offers a wealth of information to help you get the start you need to be college ready. Please take the time to study online before you take the test. Again there is no cost for this test. Please see Mrs. Hoyt in the Career Center to sign up or if you have any questions.